Keeping different types of livestock in the same pasture can help you maximize the amount of use you get out of your facility. When you are considering putting two different species of animals together in the same pasture, you need to consider the individual needs of each animal as well as their natural behaviors and decide whether or not your animals are going to be safely compatible. Horses are large, but relatively fragile, herbivores. They are prey animals who prefer to run away from perceived dangers versus putting up a fight. 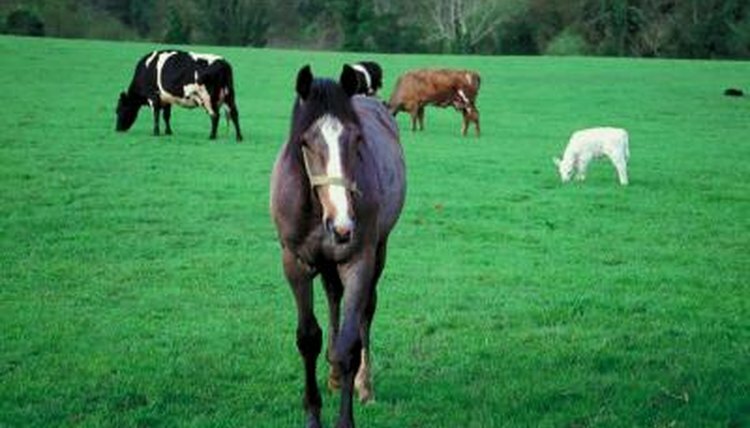 Horses use their pastures predominantly as a source of nutritional forage. Horses are physically designed to consume large amounts of grass and hay throughout the day and a pasture serves to provide them with this necessary nutrition. Horses prefer to live together in a herd. If a horse is placed in a pasture alone, he may become stressed or anxious. Horses will accept donkeys, cattle and even goats as companions in the pasture if they do not have another horse as an option. Pigs are livestock but they do not have a lot of similarities to horses. Pigs are voracious omnivores who will eat almost anything you offer to them. Pigs graze on pasture grasses, but they also root through the dirt and enjoy consuming various roots, bulbs and even insects they come across. Pigs are mostly kept in enclosures with other pigs or in solitary housing. Domesticated pigs and horses generally are not considered to be a good choice of pasture mates. Horses and pigs have little in common and are unlikely to form an emotional bond even if you turn them out in the same pasture. In addition to their lack of emotional friendships, releasing pigs into your horse's pasture can put your horse at risk. Pigs are notorious for rooting up the ground in the pasture, which will destroy the ground and prevent the fragile forage your horse needs from growing properly. If your pigs dig holes, your horse risks tripping in the holes and being injured. Pigs also can become quite aggressive during feeding times, your horse may be injured if he gets in between the pig and some food the pig wants. Pigs are heavy animals who can do serious damage to a horse if they decide to charge or bite. Arkansas State University: What is Pasture Based Swine Management? Do Zebras & Horses Make the Same Sound?